For previous versions of iMovie, it used to be very important to get the codec and size "just right". 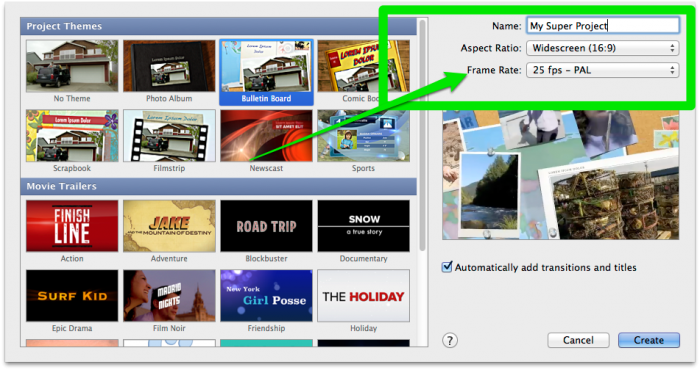 With iMovie 11, there's really only one thing that matters - aspect ratio. 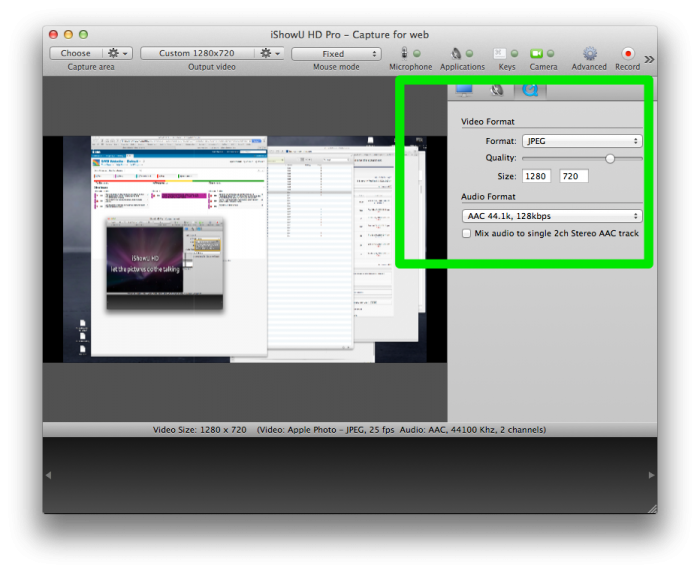 Next, in iShowU HD, change the output size to be the same aspect ratio as the iMovie project. In this case I'm intending on producing a 720p output from iMovie, so I'm going to record in 1280x720 from iShowU HD. Once you've created your project, as long as you produce 16:9 content from iShowU, you'll be able to import that into iMovie and it'll look OK.If however you want pixel perfect content, you'll need to match your desired output size as well. If I want to produce a final movie at 1280x720, then I'll need to have iShowU output footage at 1280x720 as well. If I were to produce (from iMovie) 960x540, still a 16:9 format but smaller, then I can still use my 1280x720 footage that I created earlier. iMovie will scale it down when it produces the final output, and it'll look fine. However: if I wanted to produce a full HD (1920x1080) movie, my 1280x720 footage from iShowU would be scaled up and won't look as good. It'll look OK-ish, but it won't be as clear. To get perfect results in this last scenario I would need to have iShowU produce footage at 1920x1080.